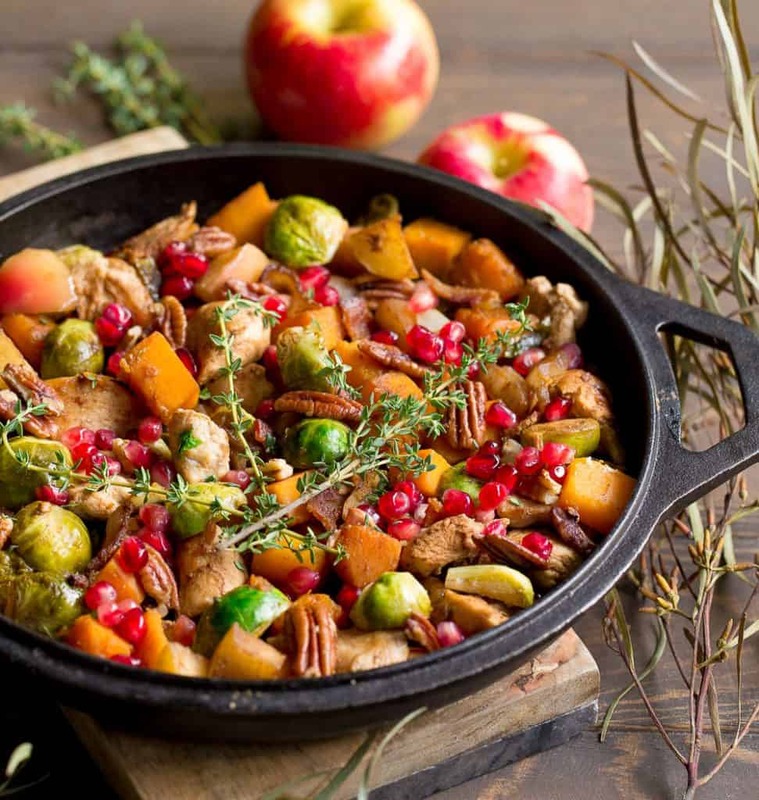 This Fall Harvest Balsamic Chicken Skillet is exactly what your dinner table needs on a cozy and cool fall evening! 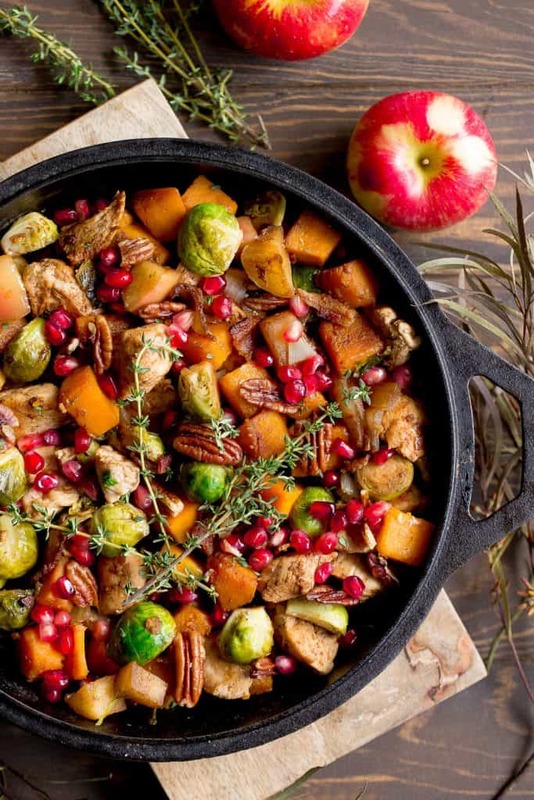 Chicken, brussels sprouts, apples, butternut squash, pecans, pomegranate seeds, and bacon all combine to make the tastiest dinner. Paleo, gluten-free, and Whole30 approved. My heart and soul (and belly) have been counting down the days to chow down on all the apple, brussels, and butternut squash combinations I could possibly eat. It’s my favorite food time of year! Meanwhile, my outside weather is telling me it’s still summer. I’ve decided to just ignore it all, and continue eating the way my body CRAVES in the fall. 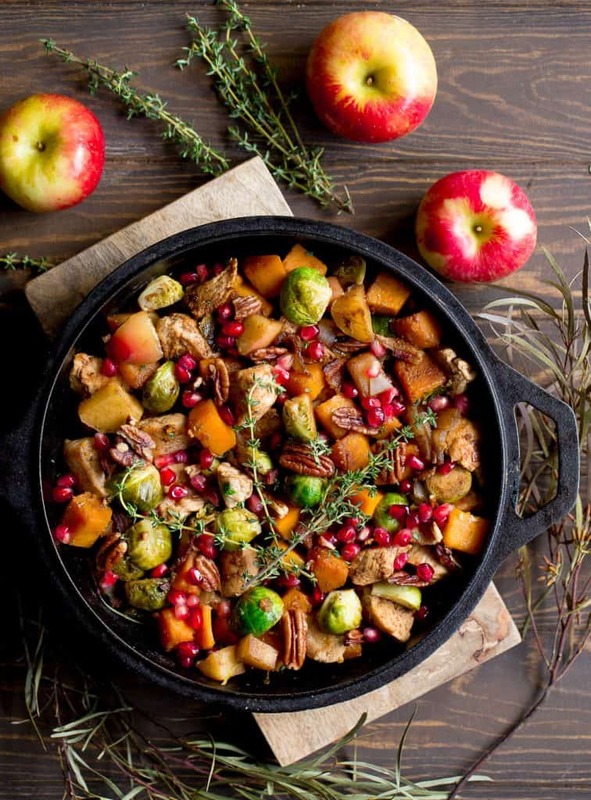 I introduce you to: Fall Harvest Balsamic Chicken Skillet. 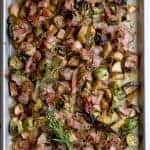 The inspiration (besides everything delicious in fall weather), is from my Rosemary Balsamic Sheet Pan Chicken with Bacon and Apples. 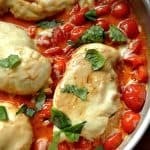 This is my absolute favorite sheet pan dinner, and I wanted something similar made in the skillet to get things extra toasty and flavorful. 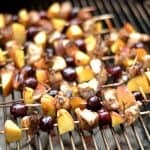 I threw in some more of my favorite fall flavors: butternut squash, onion, pomegranate arils, and pecans. I loved the way the brussels and butternut squash lightly caramelized with onion, and then were coated with just a bit of balsamic vinegar for robust flavor! 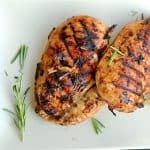 The chicken is to make this a complete meal with protein, and the bacon is just to bring out those delicious fall flavors!! You guys are seriously going to love this as much as my family did. We all ate heaping bowls, and even my 11 year old with a tiny appetite went back for a bowl of seconds. Heat a large skillet to medium-medium high heat. Once hot, spray with non-stick spray and add bacon. Cook for 3-4 minutes per side until bacon reaches desired crispiness. Set aside and crumble. Leave approximately 1-2 tbsp of bacon fat in the pan to cook chicken. Leave the heat on. Now add the chicken pieces. Cook for approximately 5-7 minutes, continuing to toss so all sides are lightly browned. Set aside with bacon. Chicken may still be slightly undercooked, this is fine since they will cook more a bit later. Keep heat on. Now coat the pan with 2 tbsp oil. Toss in onion, butternut squash, and brussels sprouts. Cook for another 5-7 minutes, until veggies become slightly browned and crispy. Now add in apples, chicken, and bacon. Toss around so all ingredients begin to flavor each other. Stir in the salt and balsamic vinegar. Let cook for another 2-3 minutes. Remove from heat, mix in pecans and pomegranate arils. Toss in fresh thyme, and additional salt to taste. Serve hot!